Describe an experience, event, place, emotion or relationship. Reflect on the meaning of that experience or person. 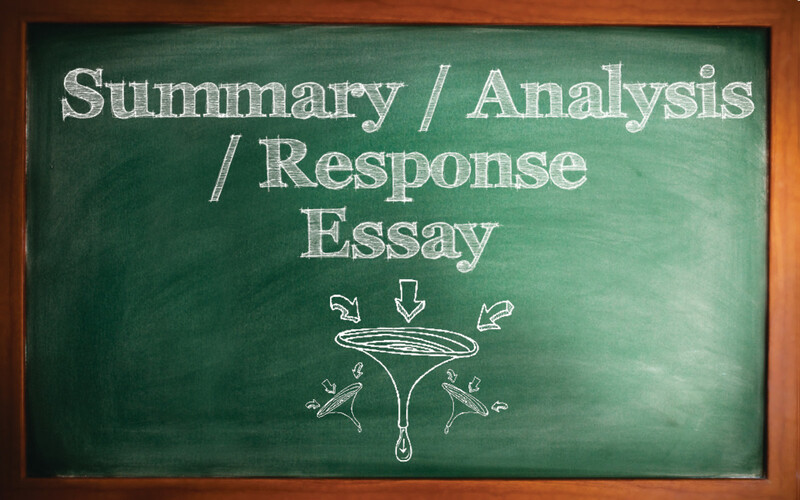 100 Reflective Essay Topics gives lots of hints to help you decide what to write about. 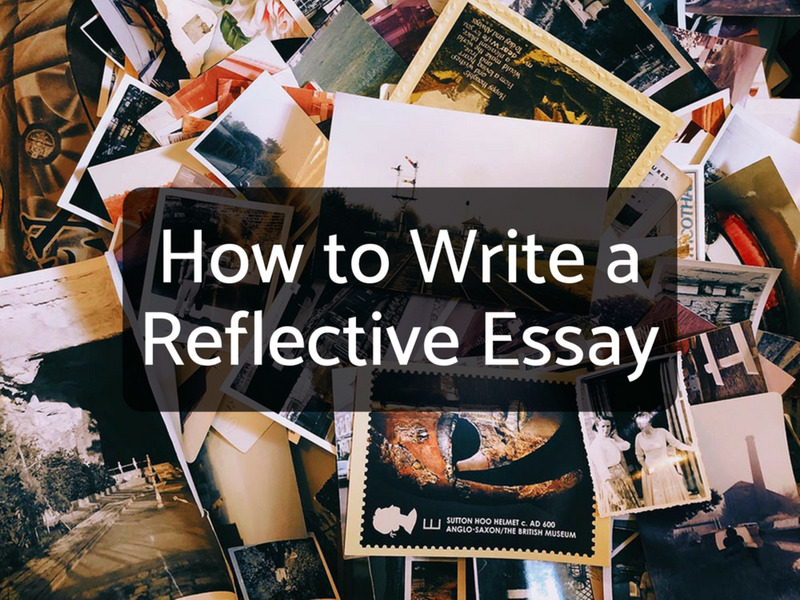 How to Write a Reflection Essay gives information about how to reflect on an essay and how to start your paper, as well as more samples. How to Write about a Person, Place or Event explains how to develop your ideas and write your paper. Looking up at the sharp laughter of the gull, I caught the sea breeze on my face and smelled the tangy salt spray from the Pacific ocean. Suddenly, I felt like I was home. I took off my flip flops and stepped down into the familiar warm, smooth, white sand. Skirting the volleyball players near Lifeguard Station 37 at the beach in Carlsbad, California, I made my way down to the firmer sand near the shore. I was just there for an hour for a walk along the beach. Most of the people I passed were spending the day. I could see the striped and flowered towels strewn across the sand and covered with water bottles, coolers, and sand toys. Walking along the shore, I watched the small kids making sand castles while their parents snapped pictures. One group of teenagers gauged the waves for boogie boarding; another group flipped a Frisbee back and forth while splashing around near the shoreline. 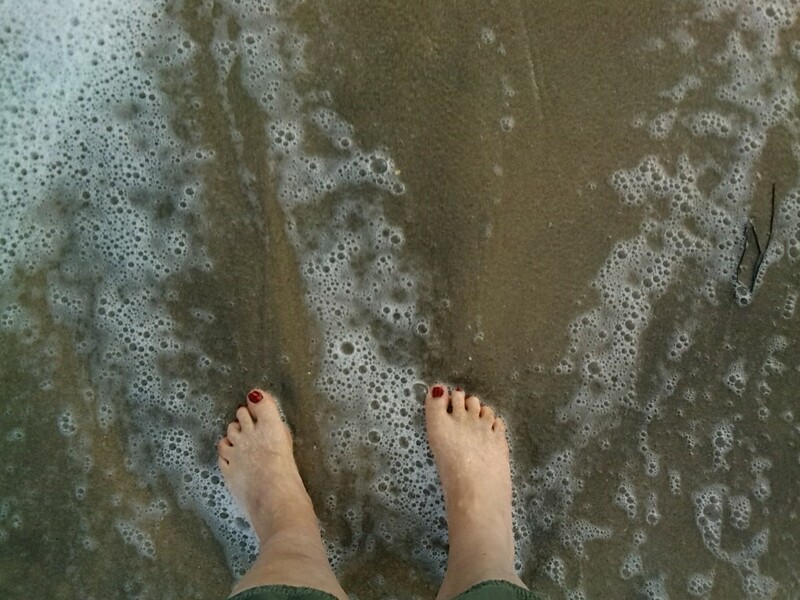 The waves bathed my ankles as I walked along just at the edge of the water. Past the lifeguard stand, a trio of surfers put on a good show and I felt my heart jump as one board flew up in the air and down upon one of them. Unconcerned, he popped up and grabbed the board and headed out again. While I love watching surfers, I've never had the urge to try it myself, but as I turned to head back, I saw something I would love to try. It looked like a parachute which was blowing down the beach. As it got nearer, I heard a motor and realized it had something that propelled it ahead. Slowly, it headed past me and I just got a chance to take a picture as it went by. Then I turned with my back against the waves to take a "selfie" of just me at the beach. Looking at the sky, I realized it was time to head back. A family I had smiled at asked if I would take a picture, "Of all four of us" the mother explained. The picture was taken, I waved a farewell and headed back, picking up a shell along the way. Just before heading back up to my car, I had an idea. 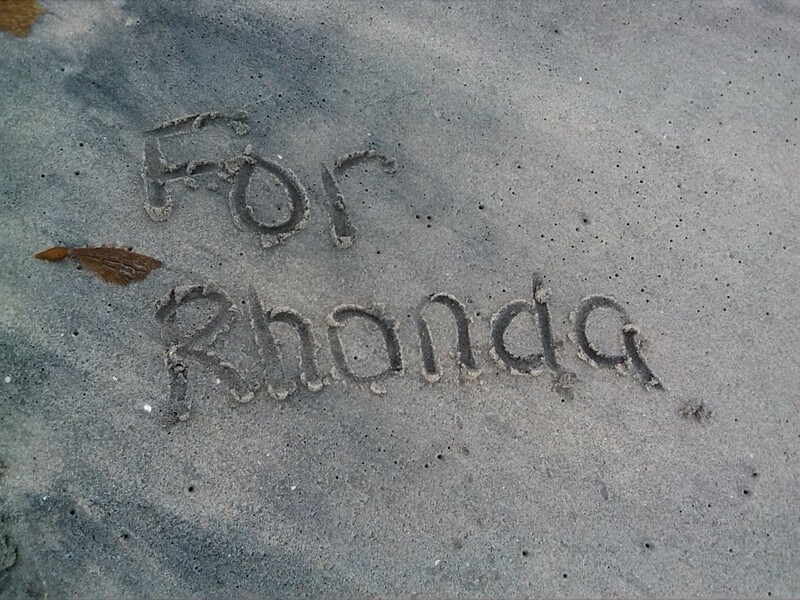 Right where the sand is wet and smooth, I bent down and wrote, "For Rhonda." Taking out my phone, I snapped a picture and sent it to my friend. As a native of Southern California, the beach feels like home. Even so, I sometimes forget to go there when I visit my mom. This week, I had come to take care of her during her cataract surgery. Along with helping her with appointments and remembering her eye drops, I'd been doing little chores around the house that are hard for her to do. 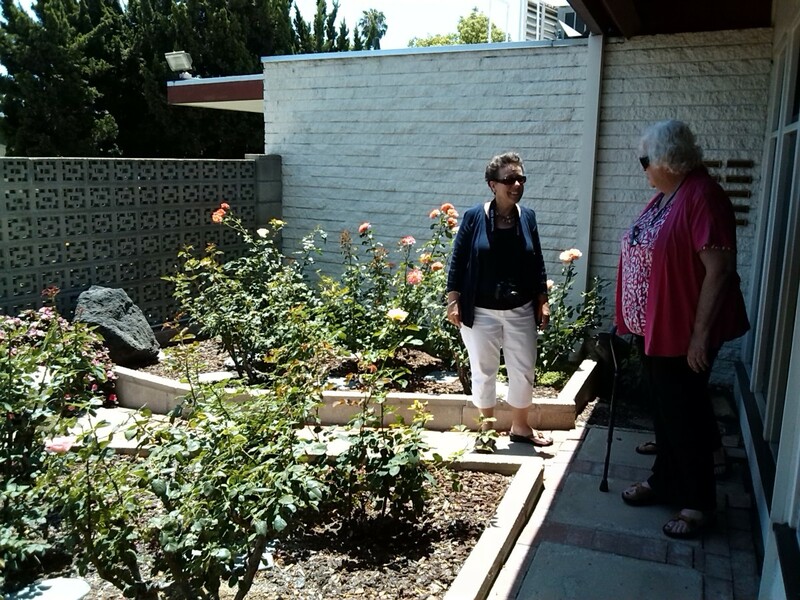 We'd also taken a visit to see my cousin and visit the Rose garden where my grandmother's ashes are buried. Moreover, we'd had a lot of good conversation, which was probably the most important part of my visit. The day before I was supposed to leave, I still hadn't visited the beach. That's when I remembered what my friend Rhonda had said to me the day I left, "Go to the beach for me when you are there!" Living in Central Texas, the beach is five hours away and the Texas Gulf coastline, while nice, doesn't compare to the shores of the Pacific. Like me, Rhonda cares for her mother, but she does it every day, all year long. Her only break over the past few years since her father died was a one week trip her husband took her to the beach in California. So, thinking about Rhonda, I had decided I needed to take my own trip to the beach. Rhonda knew what I needed better than I did myself. Walking along the beach, I saw the overwhelming beauty of the sky, waves, and sand. The waves have always reminded me of the inevitability of time and change. I needed that reminder as I brooded over the changes in my life. I have enjoyed being a mother of five children, but now my youngest is 10 and my oldest is going off to college. With some trepidation, I've been realizing that my time of being an important manager of a family and motivator of my children is not going to last forever. At some point, I will be like my mom, needing help more than being able to give help. Visiting my grandmother's grave, I realized that there will be a time when I will not have my mother with me. Moreover, there will come a time when my life will end too. Walking along the beach, I realized that I had been fearing the future, worrying that the best of life might already be over. Example: What Did I Learn? What I learned that day as I walked along the beach is that I need to stop fearing and enjoy the day I have been given. At important moments in my life, I've found that watching the waves rise up and fall away have reminded me that I am not in control, but that God is watching over all things. Walking along the beach and watching all of the different age groups reminded me that I don't have to fear changes. I enjoyed being in high school and visiting the beach with friends. As a young parent, I enjoyed taking my toddlers to the beach and showing them sand crabs and helping them build castles. Nowadays, I love watching my kids boogie board and swim out in the waves. I was reminded that I need to enjoy each stage of life, rather than straining for the one ahead or looking back at the one behind. Example Conclusion: What will I do? Can I hold on to this freedom from fear? Probably not. Inevitably, as my children seek to spread their wings, I will get nervous and I will worry. However, I think that I can remember to follow Rhonda's advice and "go to the beach." I can get away from my worries and caretaking long enough to get another perspective, and find time to pray and be at peace. Furthermore, if I can't get away from my responsibilities, I can always close my eyes for a few moments and remember: the salt spray in the air, the wind on my face, and my feet in the sand. So, how do you start writing your own essay? I've developed the following instructions to help you go step by step through the process. 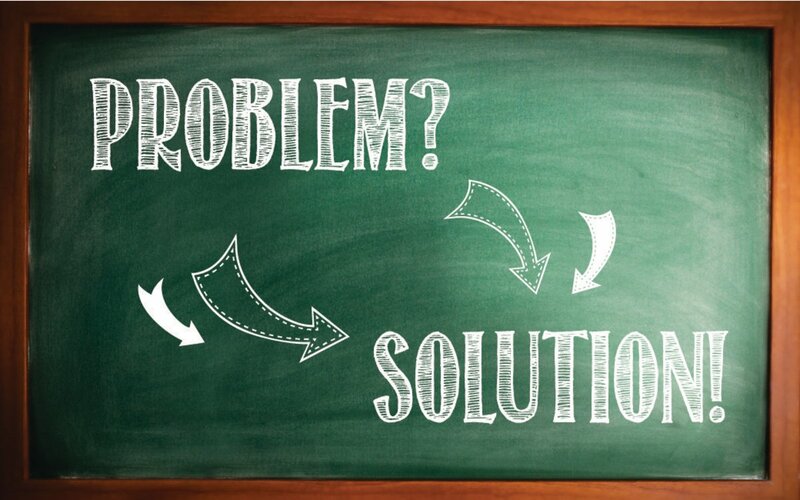 If you spend the time to answer the following questions about your experience, you will find that you can put your paper together very easily. 1. Start by making a list of possible topics. I usually start by asking students to make a list of important memories or people who have influenced them in an important way. If you need help in jogging your memory about ideas, see 100 Reflective Essay Topic Ideas. Why is this memory important? What is the meaning of that event in my life? How am I different because of this person or event? 3. 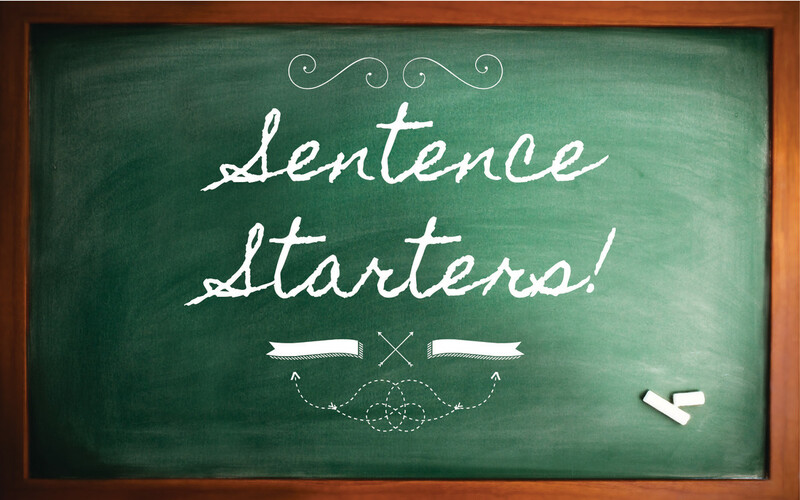 Your essay will be easier to write if you can immediately think of some answers to the above questions. Before you make your choice, it is a good idea to pick one or two of the topics and try to write down some notes answering the above questions. 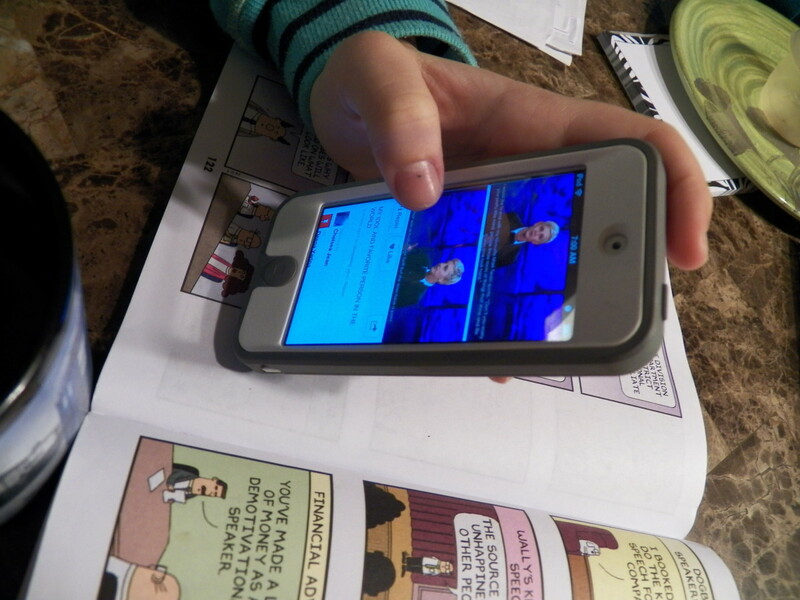 Another way to test out your topic is to talk about the memory or person with a friend or classmate. Try to explain why that person or memory is important to you. If you can explain it easily, you probably have a good topic to write about. What was going on in your life at that time (especially any conflicts or confusion you were experiencing)? Describe what happened in detail. Be sure to make this vivid by describing details about the smells, sights, sounds and feel of the experience. How did you feel? What were you thinking? What really stood out as you remember this experience? Why? Why was this important to me? How did I change as a result? What will I do differently in the future? Or what have I done differently as a result of this? What would I want other people to know? Tell why this was important. 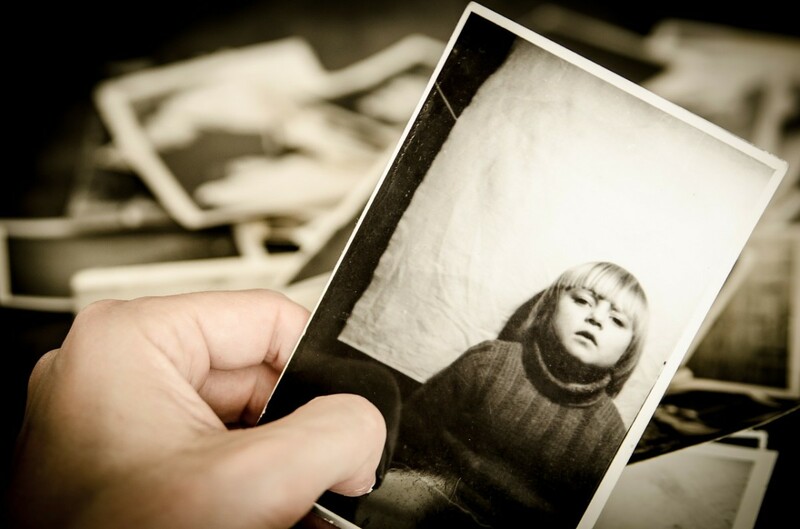 Connect that experience with something in your past. Tell how you wish it had gone differently or what you'd like to do differently in the future. After thoroughly exploring your experience through your prewriting notes, you are ready to organize your essay. See my sample for an example of how to write. If you answered the questions above in detail, you should be able to take a lot of what you've written and just reorganize it and add some transition sentences. Easy! Start in the middle of the memory. Use a vivid description of the person or place or experience. Start with describing your inner conflict. Start in the present with something that makes you think about this past experience (another event or an object). 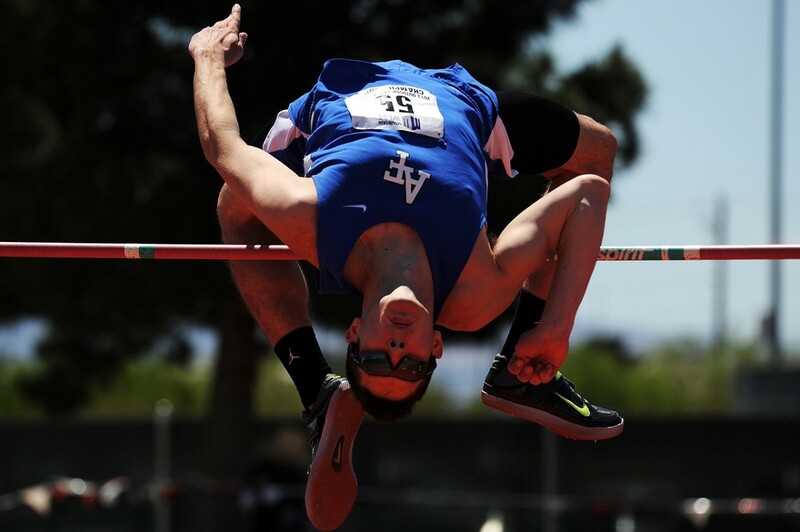 Describe the experience or person clearly and vividly with lots of details. Explain the meaning of that person or event. How you are different because of this experience or person. What you would do differently in the future or would tell others to do differently. Regrets you have, or why you are glad. Why is this place important? What does this place mean in your life? How has it helped you? Why do you remember this conversation? What did you learn? How will you act differently because of it? What is the meaning of the person in your life? How have they changed you? What have they taught you? 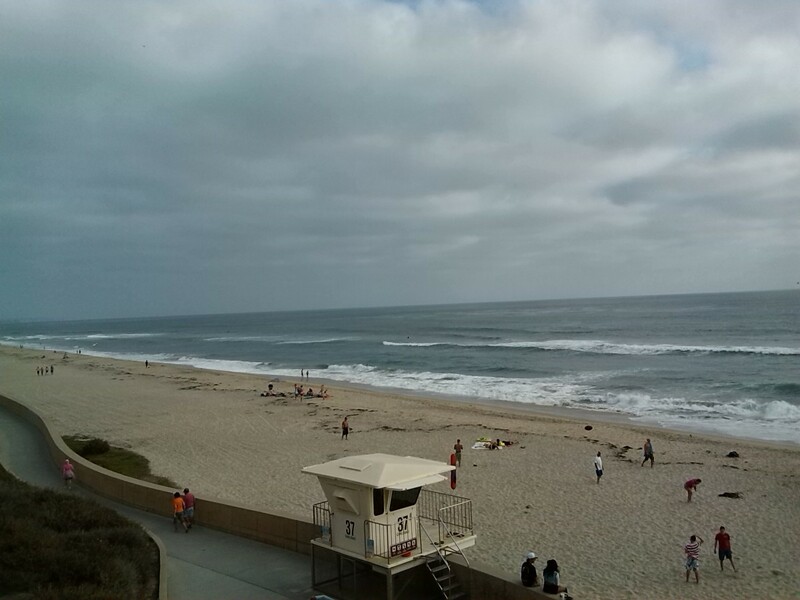 Life Guard Station 37 is off of Carlsbad Boulevard near Acacia Avenue. The flat sandy beach is a great place to walk and watch the waves. How would I start the introduction of a reflection paper on the visitation of a classroom teacher? Starting with what you expected before the visit is always an easy way to begin an essay about a reflection. Then you can tell what happened and compare that to your expectations. That technique works best if you have what I call an "expectations reversed" when what happened was better or worse than you expected. A second introductory technique is just to start describing the visit in detail. How would I start the introduction of a reflection paper on my experience at a place like a correctional facility? For an experienced essay on a correctional facility, you can describe what most people would expect from such a visit, and then the bulk of your essay can talk about whether that expectation is true or not. Alternatively, you can start by describing some small details vividly. Choose details which connect to your main meaning point. For example, if the meaning you want to convey is that there are people inside the facility who really care about the inmates, you could focus on some details that show that. How would I start the introduction of a reflective essay on coping with 21st-century university education? Generally, a good introduction for this sort of topic would be to start with describing a situation which shows the problems you have had as a University student. I like your reflective story. My mother-in-law live with us for 13 years while raising 2 boys and working full time. We are called the sandwich generation rating kids on one side and caring for parents on the other. We had a sailboat for part of that time. Being on the water was so therapeutic. Thanks for bringing back good memories. And your organization tips were very helpful. I just realized I have a topic for reflective essays — more than one. Thank you for sharing. Congratulations on your Hub of the Day award! This post inspires and reminds… :) So glad you were able to be refreshed by stopping for a bit to drink in the salt air, feel the ocean air, and let the wide sky energize you with its light. Thanks for sharing the experience and usefully applying it for us. Virginia, congrats on HOTD! I never heard of reflective essays, but this was so touching on how to write from your heart on your own feelings. Lovely pics too! Thanks for sharing. Brandon--that is really interesting. My mom lives not far from this beach and so we go there all the time. 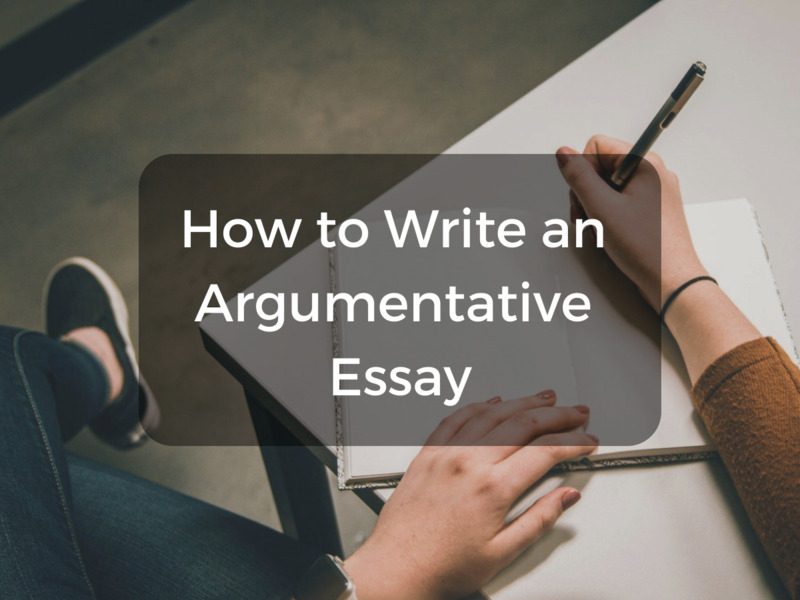 Excellent advice and tips for writing a reflective essay. Your inclusion of samples is what readers want to see. They help to understand the process. Voted up! The reflective essay itself here is a great read alone. Beautiful story you've told for us, thank you. And great tips too, which is why I came to this hub at all, but became the least of my concern after delving into your own example. Thanks for sharing, great hub. Hi, VirginiaLynne, long time no reading your hub and leaving answer. Sorry! Reflecting back on beach is really beautiful: beautiful story and beautiful hub, and lovely pictures. 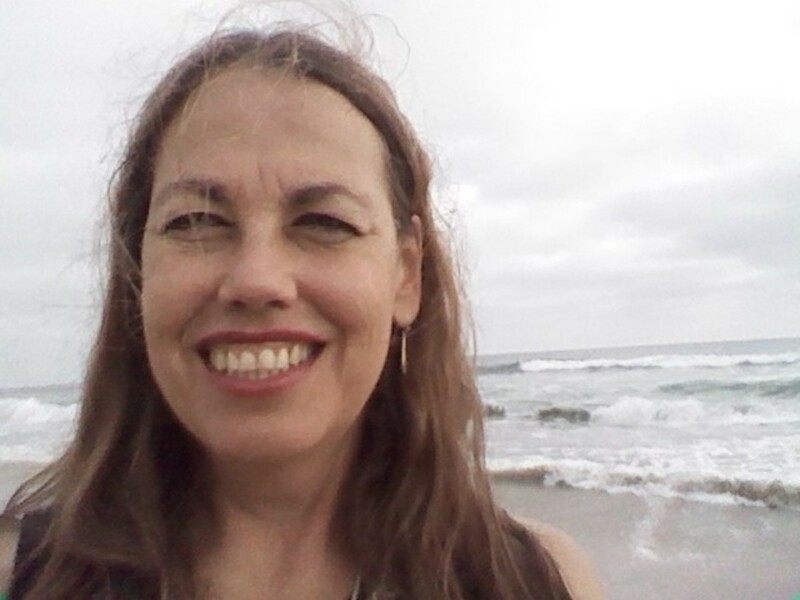 "Walking along the beach and watching all of the different age groups reminded me that I don't have to fear changes." Inspirational sentence! Keeping heart in young and memory fresh is a life principle.